Boxed wine has a terrible reputation in some circles. 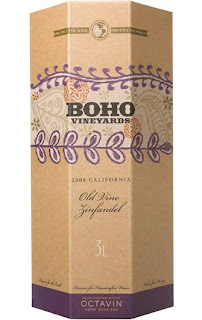 Critics charge that boxed wines lack distinction and have a manufactured taste. In other circles, however, boxed wines are preferable. And this doesn't just include folks who throw lots of big parties. Single drinkers who live alone and can have problems keeping a wine from oxidizing before they have a chance to drink it also like boxed wines because the packaging often ensures that the wine inside is free from air contact--thereby keeping the wine as fresh tasting as possible. So just in time for big Labor Day parties or for unpacking the belongings in your new studio apartment, I've got reviews of two wines that are packaged in Octavins. These are eight-sided boxes that contain a bag of wine with a spout that you poke through the front when you are ready to open your wine. You can learn more about the packaging here. The spouts themselves have a nifty and sturdy turning mechanism that makes them easy to pour and (more importantly) easy to turn off again. Inside each Octavin container is the equivalent of four bottles of wine, and the average cost for an Octavin nationally is around $20-$24--which makes the wine inside a genuine bargain--and for the two wines that I tasted, excellent QPR. 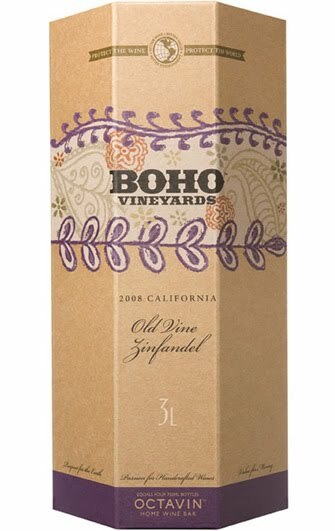 First up is the 2008 BOHO Vineyards Zinfandel Old Vines from California. This wine had a nice mix of blackberry fruit, some pepper, and some spice. It was very smooth in the mouth, and though definitely on the jammy side it still had some acidity and lightness which is to be prized in a wine of this price. Though not terribly complex, it is a nice, drinkable red that will go wonderfully with barbecue, grilled sausages or steaks, and hamburgers and hot dogs. 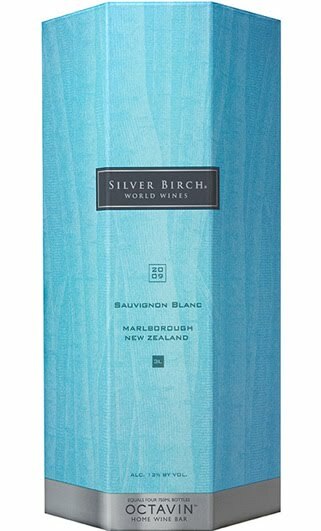 Next up is the 2009 Silver Birch Sauvignon Blanc from New Zealand's Marlborough region. This was another example of a great wine for the price, with abundant grapefruit and bitter lemon aromas and flavors, accompanied by a bit of lime. There was none of the grassiness that often comes with higher priced bottlings from this part of the world, but it was nonetheless a refreshing and nicely balanced example of a citrusy Sauvignon Blanc that would pair nicely with grilled fish, chicken, or salads.